Barn Owl Players’ second One-Act Festival played at The Barn. The programme consisted of two short plays. The first, The Dumb Waiter by Harold Pinter, was directed by Ita Morrissey and performed by Jim Carroll and John Whitely. The Dumb Waiter is one of Pinter’s recognised works and is often compared to Beckett’s Waiting for Godot. 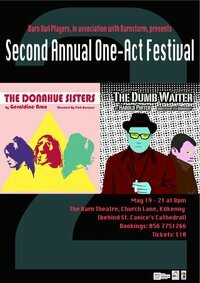 The second play, The Donahue Sisters by Geraldine Aron is set in the attic of a childhood where three sisters meet up and share stories before taking part in a dark ritualistic re-enactment. The Donahue Sisters, which premiered in The Abbey Theatre, was directed by Patricia Brennan. Mary Cody, Sinead Goggin and Janis Woodgate played the roles of the three sisters. When the Adult Drama Club started in 2007 it was with the hope that amateur theatre would flourish again in Kilkenny. Five years on and the Barn Owl Players, which emerged from the ADC and is made up of members from each of the 1st two ADC groups, has an enviable and innovative track record of productions from Love Is… a Valentine treat in the Hole in the Wall to The Whiteheaded Boy, a three-act play in the Watergate Theatre, to a series of exciting presentations in The Barn which is BOP’s home. Performances took place nightly at 8pm from May 19 – 21.